The MMC64 allows you to use the Multimedia and SecureDigital cards known from the PDA market on your Commodore 64. This means with MMC64 you can access any of these cards of sizes up to 4 GB formatted with FAT16 directly after power-up. The built-in flashable BIOS with its integrated file browser allows you to load and start games and applications, play SID files with the integrated player, or write a D64 image to floppy disk. Furthermore, the MMC64 features a 'clock port' for expansions like RR-Net, and it has a pass-through expansion port that lets you use e.g. 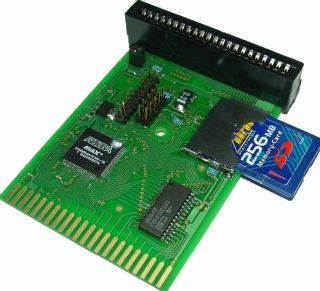 the Retro Replay or the S-CPU together with the MMC64. The latest expansion (only!) for the MMC64 is called MP3@64. It is an MP3 expansion module for the clock port connector featuring a DSP and a 20-bit D/A converter, enabling the Commodore 64 to play MP3 files in CD quality!